SDC | Society of Dyers and Colourists | Textile Coloration Certificate – would your staff benefit? Textile Coloration Certificate – would your staff benefit? The Textile Coloration Certificate (TCC) developed by the SDC will enter into its fourth year with a new intake of students for both Stage 1 and Stage 2 of the course in March 2015. The course was primarily developed for the UK dyeing and printing industry to help educate new and existing members of dyehouse staff to take on more challenging roles. This unique course bridges the gap between GCSE/A-levels and the SDC’s ASDC qualification. UK companies had discovered that there was no course available to educate young staff in the aspects of dye application to give them an understanding of the processes conducted in the dyehouse. This course enables new staff to enter into a career path to bridge the generation gap in the workplace that has occurred due to an absence of specific educational courses relating to the coloration industry. The coloration industry has embraced the course and several companies have enrolled multiple employees in a bid to create a knowledgeable workforce, for 2014, eleven companies’ registered fifteen students on the course. The SDC has also negotiated with the Worshipful Company of Dyers and the Livery Companies to be able to offer apprenticeships to companies that wish to take advantage of the TCC and build it into a holistic framework to educate the next generation of managers/directors. The TCC is split into two stages to enable students with either GCSE or A-levels to enter on the course. Stage 1 is a one year course that takes students from GCSE chemistry into the elementary chemistry of dyes and fibres with an emphasis on understanding the building blocks of organic chemistry and specific chemical groups found in dyes and fibres. Stage 2 is a two year course that takes the student further down the road of understanding the interactions between dyes and fibres, colour physics, printing and dyeing theory. This in-depth stage gives students a thorough understanding that will prepare them to progress onto the ASDC. Primarily delivered online using real-time lectures students have the chance to interact with the tutor during the lecture to improve their understanding of material being taught. Each session is recorded so that students have the opportunity to review the lesson again at a later date, for revision purposes or view a missed lesson. Each stage is supported with residential visits to the SDC where further lessons are given to allow face to face teaching and to share experiences with other on the course. 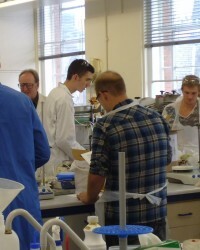 During the residential sessions there are also laboratory practical sessions where students can put into practice what has been learnt, these sessions cover such topics as dye synthesis, glass transition temperature, exhaust dyeing and printing. These sessions also give students the opportunity to network with others on the course; exchange ideas and discuss processes/practical aspects of the coloration industry. “This course gives a solid foundation about the chemistry of coloration, whether it be dyeing or printing. It helped me become more independent and confident. The support I receive is fantastic, it’s always a relief knowing I have a team of passionate, dedicated professionals at the SDC to fall back on, whose knowledge is absolutely invaluable. I really would recommend this course to anyone involved in coloration. I couldn’t think of a better way to start my career, than training and being involved with the SDC.” A quote from one of the students on Stage 2 of the TCC. Each stage of the TCC is assessed with examinations and essays to provide academic rigour to the course. The examinations are held at Perkin House and the whole course is overseen by the Examination, Accreditation and Qualification Board (EQAB). Full details of the course are available online and SDC staff are available to discuss the content, assess applications and work with companies to ensure that the investment being made by the companies is placed on a sound footing. Companies wishing to enrol employees onto the TCC should access the TCC Prospectus and Learners Information Pack, which give full details of each stage and lecture/examination dates, available on the SDC website here and complete an application form for the 2015 term.